No. 65, Jalan Mutiara Emas 5/26, Taman Mount Austin, 81100 Johor Bahru, Johor, Malaysia. 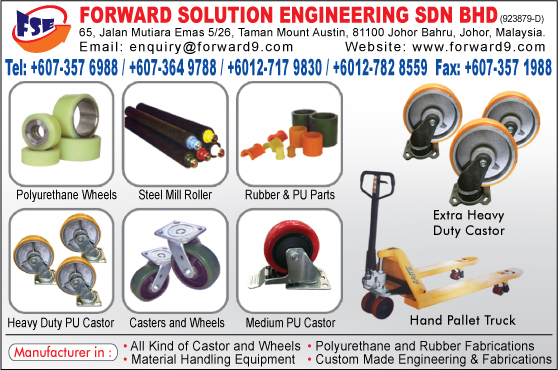 Forward Solution Engineering Sdn Bhd as an industrial supplies and subsequently as a manufacturer of polyurethane industrial components for use in various industries. Progressively, we have been at the forefront of innovations, fabrications and sourcing for industrial, engineering plastics and polymer products. 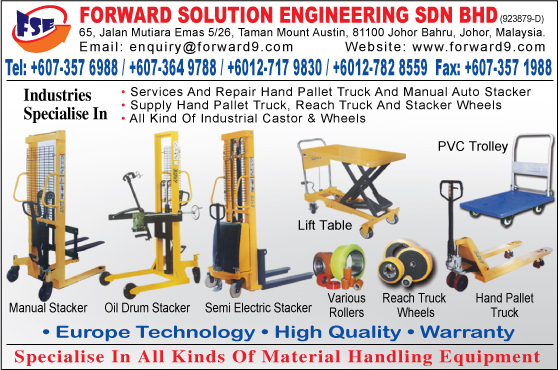 Polyurethane Specialist of Coating & Recoating, All Kind of Castors & Wheel, Material Handling Equipment, Repair and Service for Reach Truck, Forklift and Hand Pallet Truck, Pipe Racking System, Racking System, Engineering Plastic, Supply and Fabrication of Nylon, Industrial Hardware Supplies, ESD Products, Engineering Works. We have a team of nimble professionals who are dedicated towards complete customer’s satisfaction. They follow highly ethical business principals to deal with customers and serve them as per their tastes and preference. Our team plays a pivotal role in determining our success in today’s competitive market.